Sheikh Hasina is already upset at India’s failure to deliver on a promised settlement for sharing the waters of Teesta, with Mamata Banerjee playing the spoilsport. The biggest fallout of the NRC updating could be India’s relations with Bangladesh, which has been on an upswing since Sheikh Hasina took over as Prime Minister in January 2009. Leaving out 40 lakh applicants from the final draft of the National Register of Citizens (NRC) in Assam has raised a furore. Many are blaming the large number of exclusions on the haste and hurry during the final stages of the exercise. Some of the exclusions, to say the least, are pretty weird. Why would the nephew of the former Indian president Fakruddin Ali Ahmed, as Assamese Muslim, not find his name in the NRC? Why would the wife of the deputy speaker of Assam assembly Archana Pal or a two-time MLA Maulana Mazarbhuiyan be dropped from the NRC draft? Worst, two lawmakers -- Ramakanta Dewri, BJP MLA from Morigaon. and Ananta Kumar Malo, AIUDF MLA from Abhayapuri, -- don’t find their names in the NRC. Dewri is furious because he is Assamese. “I am a son of the soil and I don’t feel the need to prove my citizenship ,” Dewri was quoted by an Assam-based news channel as saying. “I feel the indigenous communities and tribes need not try to prove their citizenship,” said Dewri. Mallo, however, is hopeful he would finally make it to the list after fresh claims and objections are filed in August. That is exactly what many among the 40 lakh, whose names don’t figure in the NRC draft, are expecting. They have taken to heart home minister Rajnath Singh’s assurance (and that of the Supreme Court) that this was “only a draft” and those who were genuinely Indian should expect to get their names finally on the NRC by the end of the year. But aggressive statements by BJP politicians – one Telengana MLA even saying illegal Bangladeshis and Rohingyas should be shot – are complicating the scenario. As is West Bengal CM Mamata Banerjee ‘s threat of “much bloodshed and civil war “. With the BJP demanding an NRC update in West Bengal (and Mamata opposing it furiously) and some regional groups demanding the same in other Northeastern states, it is clear the NRC is becoming a dangerous card in the sordid game of political confrontation across the whole of India’s east and Northeast. The irony is that Tripura’s BJP chief minister Biplab Deb was quick scuttle proposals for an NRC in Tripura , demanded by tribal parties, one of which is a BJP ally. “There is no foreigner in my state, we are all Indians,” Deb commented after the NRC draft was published. The biggest fallout of the NRC updating could be India’s relations with Bangladesh, which has been on an upswing since Sheikh Hasina took over as Prime Minister in January 2009. 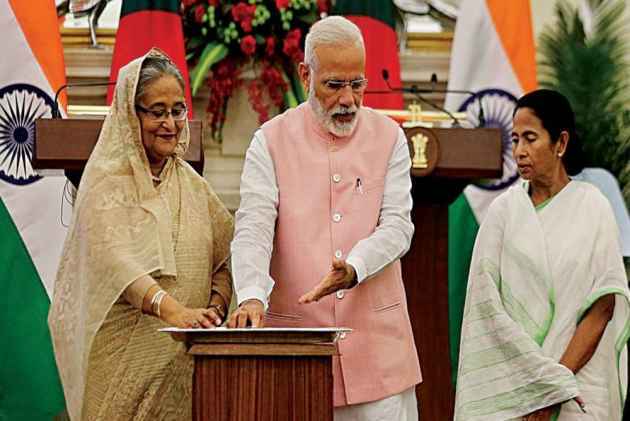 Hasina has addressed all of India’s security and connectivity concerns, from driving out the Northeastern rebels to providing India transit facilities. Bangladesh is crucial to the success of India’s Look East (now ‘Act East’) policy . Hasina is already upset at India’s failure to deliver on a promised settlement for sharing the waters of Teesta , with Mamata Banerjee playing the spoilsport. This hugely impacts her electoral prospects with Bangladesh parliament polls due at the year end. Now, with the shrill anti-Bangladesh rhetoric from India’s ruling party – Amit Shah warning the Opposition not to defend Bangladeshi illegals in Parliament – Hasina would be nervous at all this talk of pushback. Bangladesh accepted 52 illegals last week but there is no way it could accept lakhs and millions. The final NRC draft will come around the same time Bangladesh polls are due and the Islamist Opposition will doubtlessly make a huge issue of the denial of citizenship in Assam to tens of thousands of Bengali Muslims, who have been hit the worst. Accepting 10 lakh Rohingyas was seen as an inevitable humanitarian gesture – accepting anyone from Assam would be seen as a surrender to India. So, Hasina’s information minister Hasanul Huq Inu has been quick to react. Within a day of the publication of NRC update, Inu told the Indian media that the “NRC was India’s internal problem.” Which means all those not finding their place in the NRC are not Bangladeshi illegals, as alleged here, but Indians. Meaning indirectly there was no question of taking them back. Those in the BJP, who suggest pressuring Hasina on this issue would do well to understand India, cannot afford to drive a trusted ally into China’s welcoming arms. Inu said his country has ‘enough faith in a liberal leader like Modi – meaning his leader knew sense would finally prevail in Delhi. If that be so, and India does not try pushing anyone back into Bangladesh, what will happen to those who don’t find their names in the NRC after 31 December 2018? If their numbers run into lakhs, are we not looking at a huge mass of stateless persons floating around in a sensitive frontier state with a history of much ethnic strife? The impact on families is scary. The head of Bengali department of Cotton State University, Prasanta Chakraborty, told journalists that the names of his two elder brothers have been included in the final draft but those of their wives and children are missing. There are so many cases such as those. Leave aside the harassment and humiliation of having to file claims all over again and chase officials who are often less than sympathetic, what happens if they finally don’t make it?